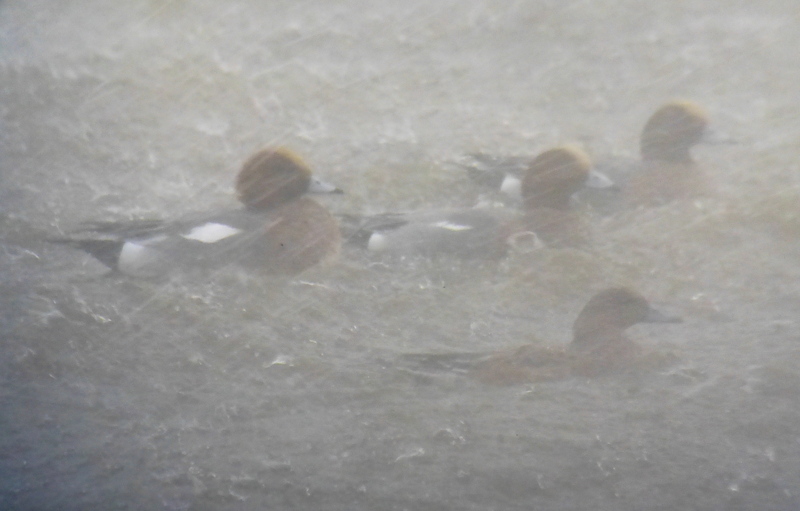 The plan was to shelter in hides either at Marshside or Martin Mere today after I’d picked up Neill and Trops. Conditions were bracing – at least a Force 100 SWly with driving rain in quite staggering proportions, so the obvious thing to do was check out the Marine Lake to see what had blown in. 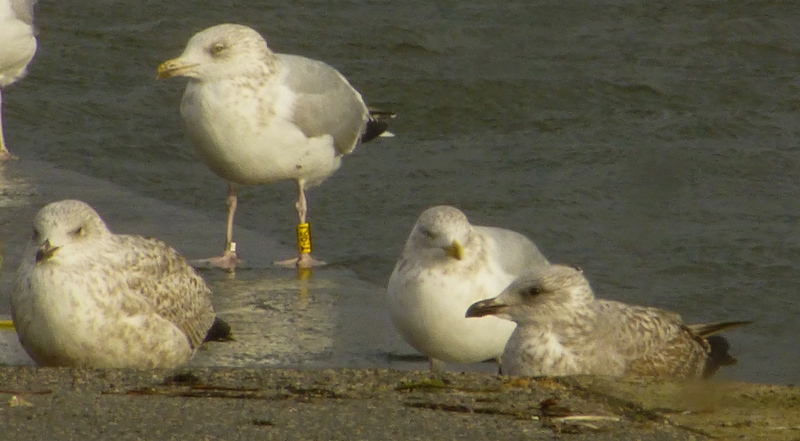 Unfortunately the weather was too bonkers to see much, apart from a GBB killing a Coot (I wasn’t expecting that) and a colour ringed Herring Gull (T:96J). I drove round to Marshside and we staggered against the wind down to Nels to get out of the hooley. Most birds were keeping low – a passing Peregrine trying to head south was going backwards over the golf course, but a female Goosander going south lower down fared better at about 1230 – my first at the old patch for quite a while, I wouldn’t be surprised if it ended up on the Marine Lake. As the above picture shows. By the time we got out of Nels the tide had completely covered the outer marsh, so we motored up to Crossens and checked the floods – stacks of wader, especially Oystercatchers, but Redshank, Dunlin, Golden Plover, Curlew, Rock Pipit, gulls and Skylarks too, shame it was too wild to get a steady view of anything. With the light fading we pushed on towards Banks and Hesketh Bank, finding one of the Great White Egrets cowering in the corner of a field on the Old Hollows Farm bend, while a herd of about 70 Whoopers off Guide Road seemed to have a Bewick’s or two among ’em, but they kept disappearing amongst the sprouts, wind and rain…there will be easier days to watch ’em this winter no doubt. Flocks of Fieldfare and Starling on the ploughed fields just north of Banks. Fairly quiet on the coast earlier this week, with not much time to get any birding done in the face of a beserker work load, but the Caspian Gull floated by the office at Ainsdale a few times, and a female Sparrowhawk was working the frontal dunes hard for a day or two before conditions got too wild – I hope the Black Redstart kept its head down. 70+ Twite between Southport Pier and Fairways on Wednesday, with Raven and Marsh Harrier on Crossens Outer the same day. A Peacock butterfly was on the wing at the end of Dawlish Drive at Marshside on Friday. A seriously refreshing evening in the Legless Arms (you know it’s a good ‘un, when you can almost persuade the guys to think about a trip to Antarctica – until they see the slightly truncated list that is) meant I was, ahem, a bit slow out of the traps today. Bitterly cold obviously with 40+ Tufted Duck, Shoveler and 11 Gadwall hunched up under the branches at Sands Lake before I headed out onto Plex mid-afternoon. A dusting of snow powdered Winter Hill in the distance and the air felt icy. 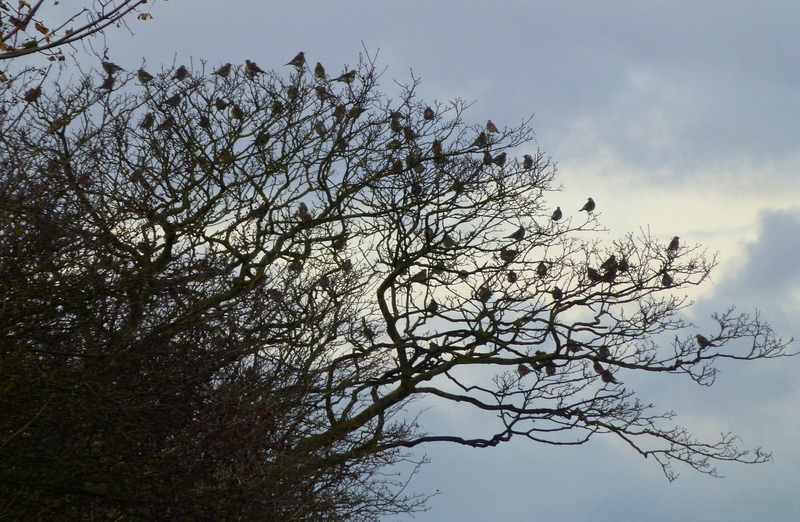 I spent an hour or so watching the Fieldfare flock as the light faded – about 50 birds with smaller numbers of Redwing, Mistle Thrush, 5 Pied Wagtails and 1 Grey Wag which foraged around the puddles of a soggy ploughed field. The Fieldfare were as wild and skittish as ever – spending much of their time gorging on berries before dropping down into the field to rummage. No amount of car gymnastics could help me get anything other than poor digiscoped shots – that superdeluxe bridge camera seems like a better idea every day! A small party of five Whooper Swans called as they circled over the moss – there was a herd of about 60 on the fields between Carr Moss Lane and Segars Lane a bit later on. An incredible combination of cold and sound that’s impossible for me to describe in words, but so, so Whooper, so winter. 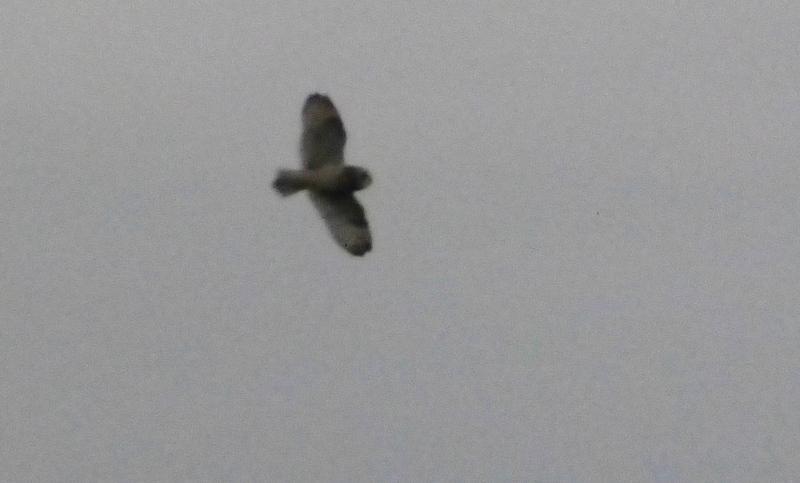 Just one or two Mipits, Buzzards and Corn Buntings as the light went, and as I headed back over Carr Moss, a fine hunting Short Eared Owl being hassled by a Kestrel. Not many Pinks about though. 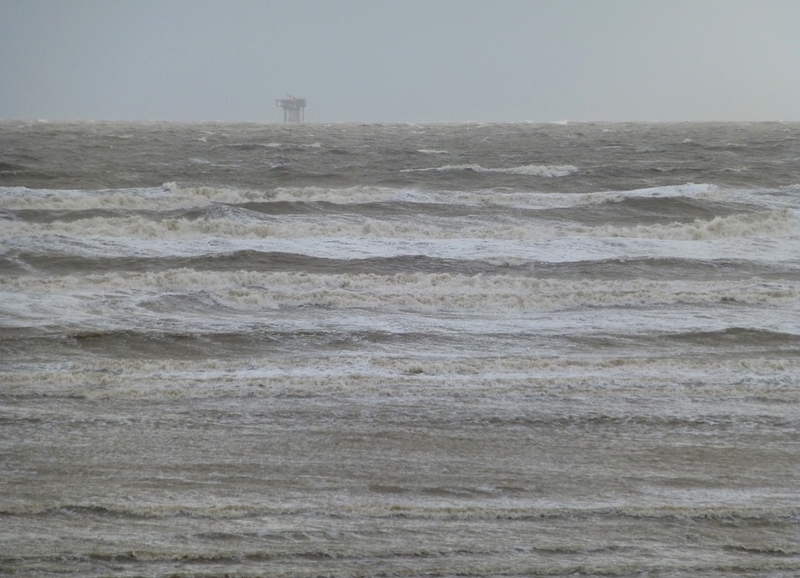 There are times when you question your sanity…so it was today when I tried to seawatch the balmy zephyr that is Abigail from the dunes at Ainsdale over lunch. Force 7 south westerly at least, with hail, rain and too much aerial sand to make it feasible…all I managed was trashed optics, a single Great Crested Grebe and Wigeon, 2 RB Mergs, a sub-adult Gannet (later on) and fragments of the scoter horde looking distinctly queasy as they were hurled around in the boiling sea. It was a sandblasted nightmare, interspersed with dashes of hail, gull and icy rain. 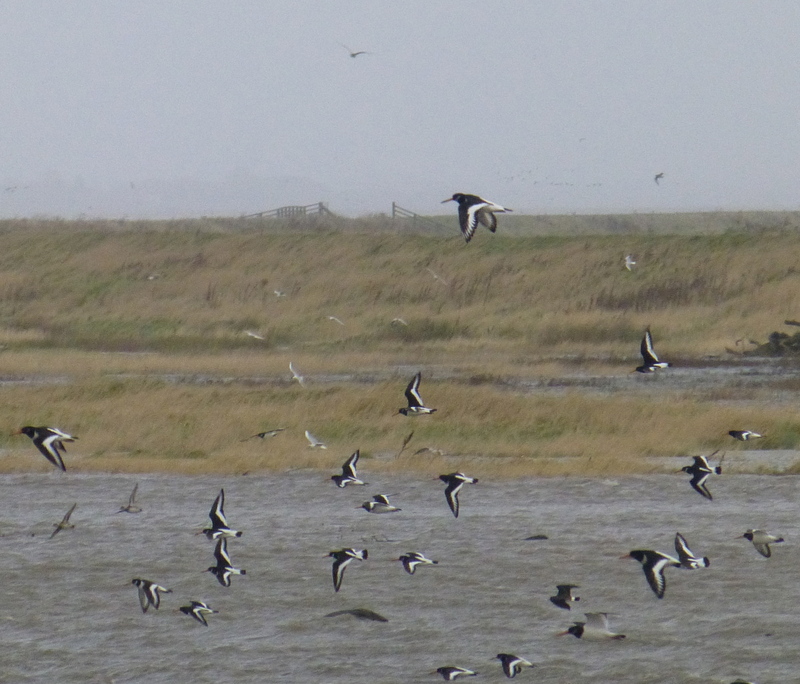 To be honest I was hoping for a Leach’s Petrel – birds were seen off Wirral and Fylde, so there’s always a chance. More often than not though it is easier to pick ’em up at Ainsdale over the sands when the tide has receded, but not today. I was thinking back to the last big “late” Leach’s wreck in 2006 – you can read about that at Richard Smith’s excellent Dee Estuary website in his newsletter from 2007 here, albeit from an inevitably (and understandably) Wirral-centric point of view. I was just dropping some stuff off at the office at 1pm when a zippity zip movement sweeping up onto the gutter of Ainsdale Discovery Centre caught my eye. 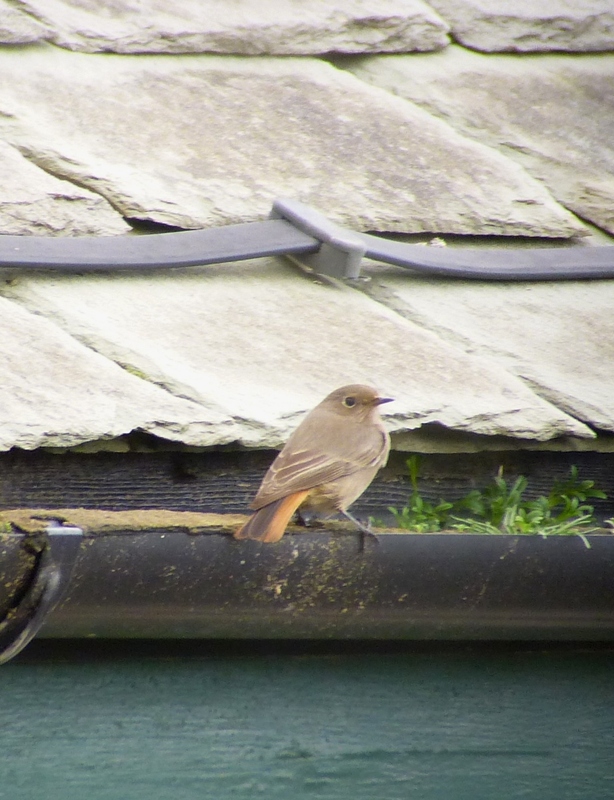 Dropped all the garbage I had with me and got the bins on a fine young Black Redstart, all quivery orange tail and nervous energy. 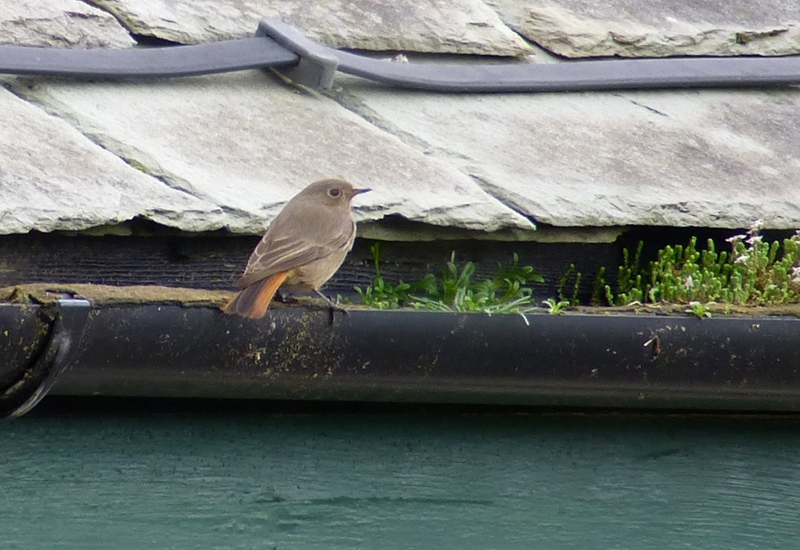 Just time for some blat blat blat digiscopage, then it flew up onto the apex of the roof of our office before flitting away into Pontins, Ainsdale. Might come out again later. Might not. Beats squinting at the scoter horde. Completely appropriate weather for what’s always a sombre and moving morning, but I’d hoped it would pick up a bit in the afternoon as I got out onto the mosses – it didn’t. 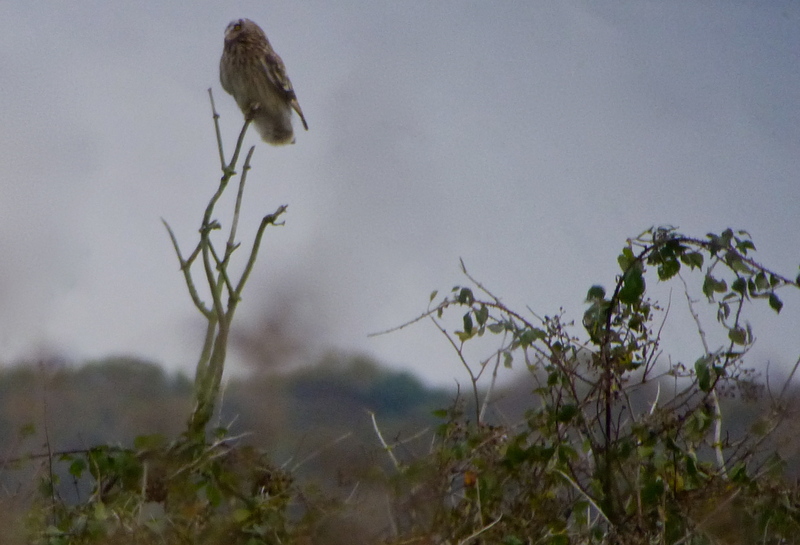 Low grey cloud, rain and strengthening wind made for typical “November grim”- blackening trees, wet fields and mud – so I was surprised to see two Short Eared Owls perched up in the fading light when I finally made it to Lunt Meadows late on. Gorgeous things, they were hassled by the local Kestrels and spooked by walkers, but in conditions this bad I wasn’t expecting any on the wing, so the encounter was a plus. At least three birds up (with as many as seven seen in the week here), with a far more sensible Barn Owl hunting from a sheltered post in the lee of one of the plantations. Siskin, and small numbers of Fieldfares and Jays moving through, but the light was fading fast and as the rain got heavier I splashed off the site at about 4pm….too gloomy for digiscoping, but great to watch the owls. Earlier there were Fieldfares on the Withins (20+) and a particularly large, wild and flighty flock on Plex (120 birds); and at least two Grey Wagtails through overhead there. Still feels strange to drive the tracks over there now they’ve been resurfaced…where’s the fun in that? 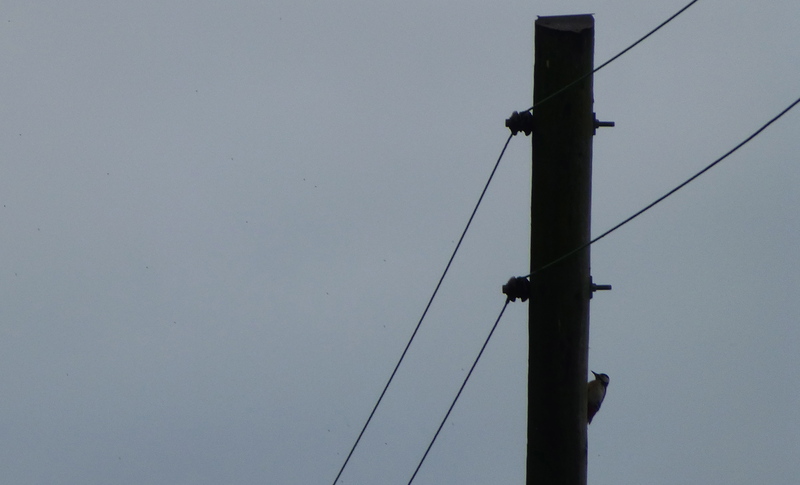 Great Spotted Woodpeckers on Plex may have been migrants too – or just local birds checking out the old telegraph poles for a change. I ‘scoped three different Greater ‘Peckers, but none showed any characteristics of northerns unfortunately. 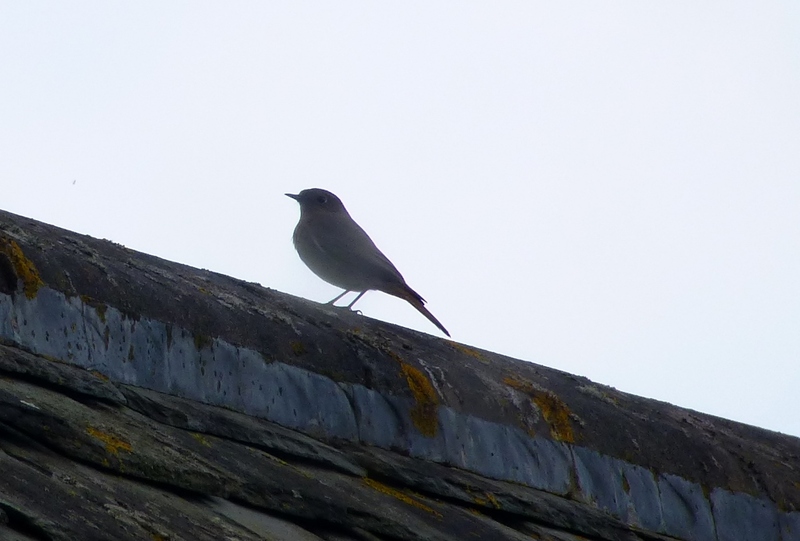 Not too many Skylarks or Corn Bunts out there today either – but that’s hardly surprising given the weather…sensible beasties were sheltering today rather than wandering about. With the mist lifting this morning, I began to notice a few Fieldfares and Redwings moving south over the dunes at Ainsdale. The “Ainsdale Common Scoter Scarf” was too far out and the tide way too low to consider ‘scoping, so when a Swallow zoomed past the tower just before lunch I decided the best option was probably a stroll in the dunes. The Swallow, a young bird, was still hawking for insects around the top of Slack 170 when I got there (the first big open area south of Ainsdale Discovery Centre), and a few Skylarks were moving high enough up in the grey to rule out local traffic. 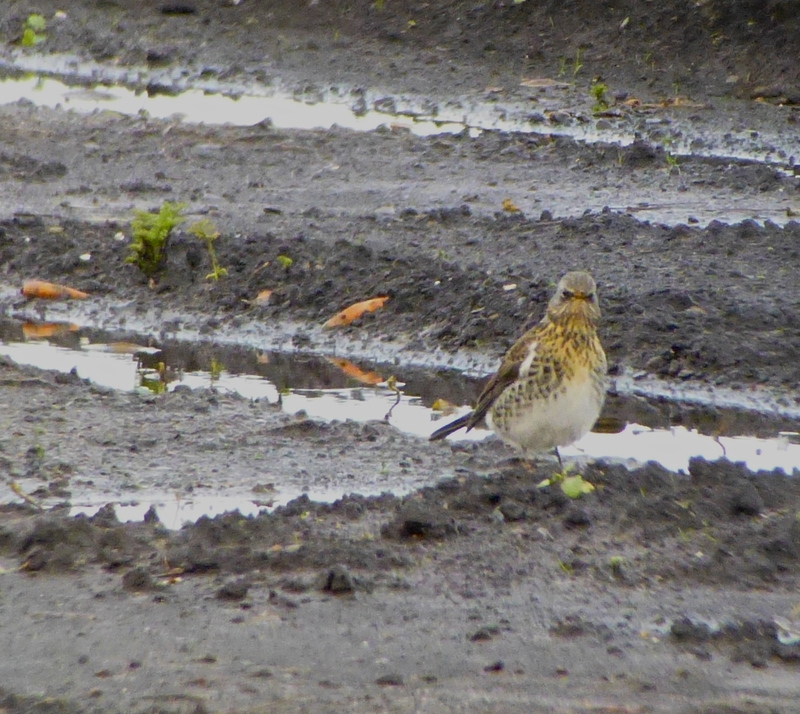 Another Fieldfare dropped in out the sky. 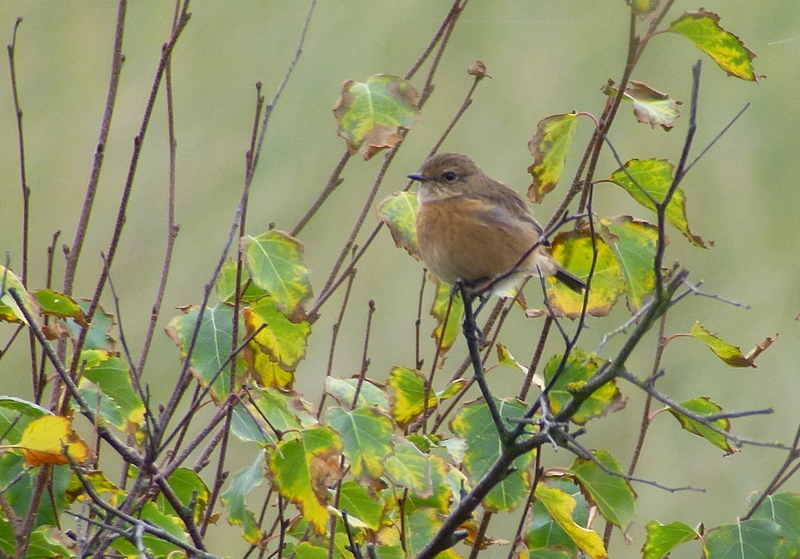 Just a handful of Mipits though, and to be expected Reed Buntings, but I could hear Stonechats calling, so went to the bottom end of the bone-dry slack, where two males were chasing each other, as a young bird “wheeze-chack-chacked” constantly. The males never stopped a weird “slow motion” circling chase all the time I was there. The brighter bird never gained on the other, or tried to, they just kept circling in some kinda loonball chat conga.